This past summer on July 5, Irina Ratushinskaya, former Russian poet and novelist who survived four years in a Soviet prison camp, died in Moscow. 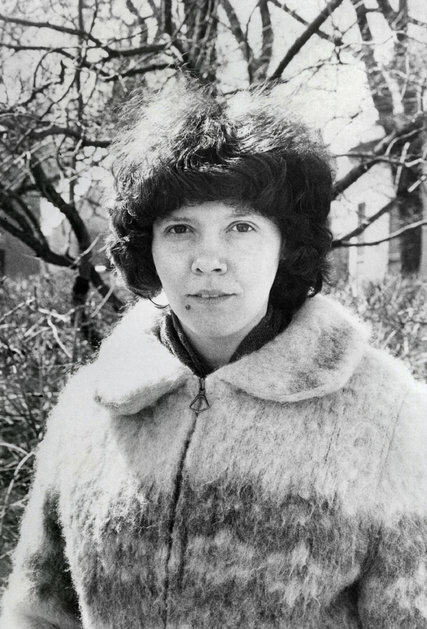 Her heroic story captured the attention of the West after being arrested in 1983 for anti-Soviet propaganda. 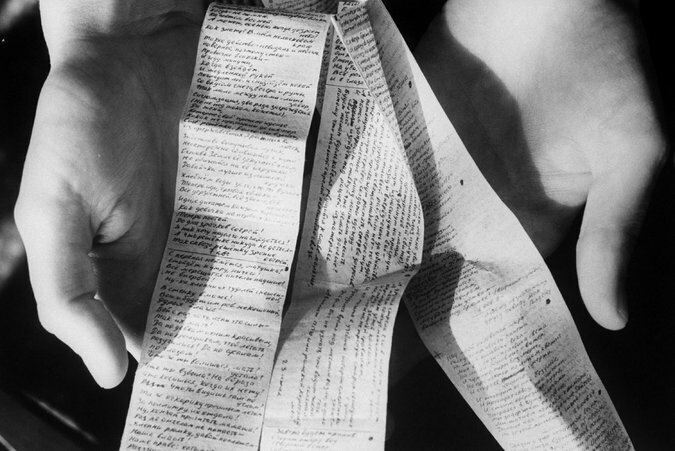 She composed hundreds of poems while in prison and smuggled them on cigarette paper through her husband. She was released before the Iceland summit meeting between Mikhail Gorbachev and President Ronald Reagan in 1986 and would later meet the U.S. President in Washington, D.C. after securing her freedom. The papers of Irina Ratushinskaya came to Special Collections, Buswell Library, beginning in the summer of 1992 through contacts of Associate Professor of Communication Emerita, Myrna Grant. They include works of poetry, correspondence, articles, audio and artwork. As well, they include a memoir of her time in prison, entitled Grey Is The Color Of Hope. The largest portion of the collection is devoted to secondary material about Ms. Ratushinskaya while she was imprisoned and as human rights individuals advocated for her release. And I will tell of the first beauty I saw in captivity. Only a blue radiance on a tiny pane of glass. In April 1987, Irina spoke at Wheaton College while she and her husband, Igor Gerashchenko, were guests of Northwestern University in nearby Evanston, Illinois. Harold “Red” Grange, one of the greatest American football halfbacks, was responsible for knocking out the teeth of many players on opposing teams. As a celebrity endorser, the Wheaton native was (less directly) responsible for rotting out the teeth of many admiring children with the distribution of the Red Grange candy bar, which included a collectible trading card displaying “The Galloping Ghost” in action. 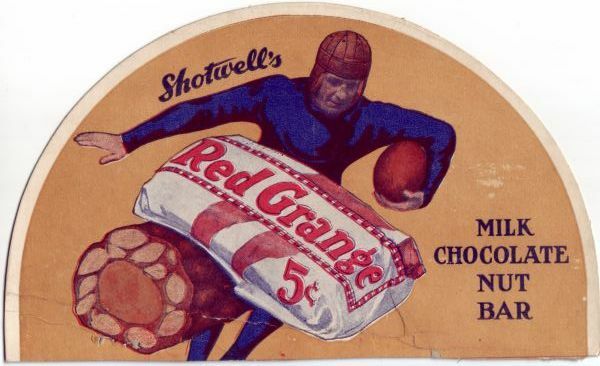 Produced in 1926 by Shotwell Candy Company, the Red Grange candy bar struggled briefly in the competitive sweets market before disappearing forever. …I think about the candy bars of my youth that no longer exist, the Skrunch Bar, the Starbar, Summit, Milk Shake, Powerhouse, and more recent bars which have been wrongly pulled from the shelves — Hershey’s sublime Cookies ‘n Mint leaps to mind — and I say kaddish for all of them…Oh where are you now, you brave stupid bars of yore? Where Oompahs, those delectable doomed pods of chocolate and peanut butter? Where the molar-ripping Bit-O-Choc? And where the Caravelle, a bar so dear to my heart that I remain, two decades after its extinction, in an active state of mourning? Whether the retirement of the Red Grange candy bar was mourned or not, it has joined the pantheon of discontinued candies: Cherry Humps, Blizzard Bar, Clark Coconut Bar, Bob Cat Candy Bar, Jumbo Nerds, Goodnuff Peanut Bars, Luv Pops, Goofy Groceries, Life Savers Holes, Gatorade Gum, Merri Mints, Orange Heads, Tangy Taffy, Wonka Bar, Mr. Buddy, Bit-O-Licorice, Bonkers Fruit Chews, Mr. Melons and many more.